I was delighted to present a workshop on Polarity Management to the New England Alumni of the Harvard Kennedy School (HKS). 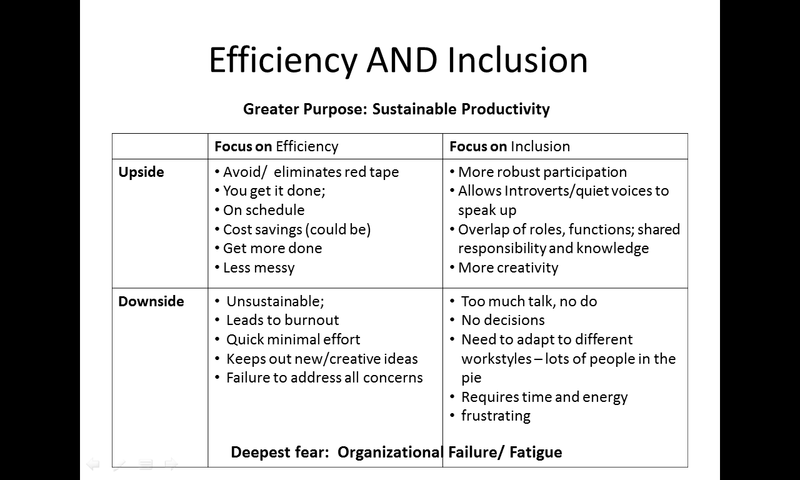 Polarities are “interdependent pairs that need each other to achieve a higher purpose or outcome that neither can reach alone.” (Barry Johnson) For example, activity and rest; balancing work and home/life; balancing tradition and innovation in an organization. We need both activity and rest in our lives; when we are over-active and neglect taking time to rest, we become exhausted. So we rest, meditate, recharge our batteries, which enables us to resume being active. Likewise, I’m sure you’re familiar with the work and home/life polarity. Once you understand what a polarity is, you find them all over the place – at work, at home, and even within yourself, as in work-life balance. The HKS participants decided to work on “Efficiency and Inclusion”. Some people, some teams and some organizations, are focused on getting the work done (being efficient), and don’t take the time to engage everybody, or to hear from everyone – which alienates some people or leads to burnout. On the other hand, there are people, teams and organizations who are focused on including everyone, for example, in decision making, which makes for long, difficult meetings, where decisions are not made or the goals aren’t accomplished. clarify who needs to be present in different types of meetings. Include time to build relationship and trust in the team or organization. talk about how that serves, or doesn’t serve, the organization. The workshop participants got some insight about how to help their teams and boards manage the tension between these poles. They’re going to introduce the model to their colleagues. What polarities are you experiencing in your team or organization? What would it take for you to introduce this model to your team? Good luck!